Our Social Committee organizes several social events in the course of the year, as an opportunity for us all to get to know one another better. Visitors and newcomers to the parish are very warmly invited to all our social events- we look forward to seeing you at one soon. A couple of times a year we organize a parish supper in the church hall: this is a full, three-course dinner often with entertainment. These events are always very popular and tickets often sell out quickly! Watch out for these events being advertised on the website. Our Vicar, Russell, is a great fan of board games. We hold occasional board game afternoons in the church hall. As well as familiar games like Scrabble and chequers, there is always a good selection of simple and quick-playing European board games, like Carcassonne and Bohnanza. Watch out for these events being advertised here on our website. 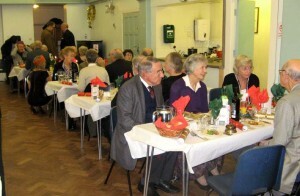 We also organize other kinds of social events, such as garden parties, picnics, and refreshments after special services. 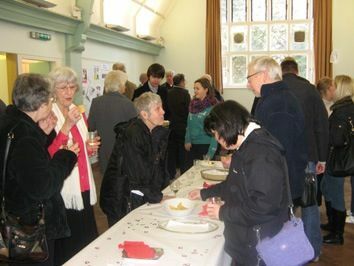 The picture shown below is of refreshments served in the church hall after our “Valentine’s Mattins” service in February 2012, when couples married at St Mary’s were invited back to celebrate.